As Troilus is not one of the Bard’s better known works, let me briefly summarize: Like The Iliad, the play opens toward the end of the Trojan War. Troilus, a son of Priam, has fallen desperately in love with Cressida, the daughter of Calchas, who has defected to the Greeks and lives among them. Cressida’s uncle, Pandarus, has contrived to bring the two together. Unfortunately, after their one night of passion, they awake to learn that Cressida has been traded to the Greeks for the warrior Antenor. Cressida arrives at the Greek camp, where she succumbs to the advances of Diomedes, a Greek general. Troilus, visiting the camp under a flag of truce, secretly witnesses Cressida’s betrayal and is heartbroken. Meanwhile, the Trojans are trying to decide if Helen is worth all the trouble. On one side is Hector, who counsels that they should give her back to the Greeks and be done with the whole affair. On the other is Troilus, who despises Helen but argues that honor can only be satisfied by defending her. In the Greek camp, the primary goal is to get Achilles to rejoin the battle. He has absented himself from the field because he made a promise to Polyxena, the daughter of Hecuba and sister to Hector and Troilus, not to fight her brothers. The other Greeks, not knowing this, blame the effeminizing influence of Achilles’ male lover Patroclus. Unfortunately, without Achilles, the Greeks are demoralized and unable to overcome Troy. Ulysses comes up with a plan to shame Achilles into returning to the battle, taking advantage of a challenge Hector has made to fight a champion in single combat. They nominate the dull-witted Ajax, and he fights an inconclusive duel with Hector. Achilles remains unmoved. It’s only with Patroclus’ death that he forswears his oath. In the battle that ends the play, Achilles treacherously ambushes an unarmed Hector and has his Myrmidon’s slaughter him. When I do tell thee, there my hopes lie drown’d. “I am giddy; expectation whirls me round. “PANDARUS: Asses, fools, dolts! Chaff and bran, chaff and bran! Porridge after meat! I could live and die i’ the eyes of Troilus. Ne’er look, ne’er look: the eagles are gone: crows and daws, crows and daws! I had rather be such a man as Troilus than Agamemnon and all Greece. 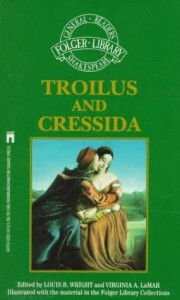 CRESSIDA: There is among the Greeks Achilles, a better man than Troilus. P: Achilles! A drayman, a porter, a very camel. P: `Well, well!’ Why, have you any discretion? Have you any eyes? Do you know what a man is? Is not birth, beauty, good shape, discourse, manhood, learning, gentleness, virtue, youth, liberality, and such like, the spice and salt that seasons a man? C: Ay, a minced man: and then to be baked with no date in the pie, for then the man’s date’s out. P: You are such a woman! One knows not at what ward you lie. C: Upon my back, to defend my belly; upon my wit, to defend my wiles; upon my secrecy, to defend mine honesty; my mask, to defend my beauty; and you, to defend all these: and at all these wards I lie, at a thousand watches. P: Say one of your watches. C: Nay, I’ll watch you for that; and that’s one of the chiefest of them too: if I cannot ward what I would not have hit, I can watch you for telling how I took the blow; unless it swell past hiding, and then it’s past watching. Prince Troilus, I have loved you night and day for many weary months…. Their love ends almost but not quite as tragically as Romeo and Juliet’s but the consequences of Cressida’s betrayal remain unresolved. She disappears from the play after Act 5, scene 2; Troilus gives an impassioned speech denying that the Cressida he sees in Diomedes’ arms is his; and then he goes off to join the battle. In Shakespeare’s day there was little sympathy for Cressida. According to the wildly popular story upon which the play is based, Diomedes spurns her, she ends up a leper, and Troilus dies. Not being a product of the Elizabethan Age, I feel a bit more empathy toward the woman, and see her as a person with low self-esteem. Thinking little of herself, when Troilus offers such unconditional love, she’s swept away. But when she’s torn from his arms and forced back into an environment where she’s nothing more than a chattel to be traded, she falls back into her old defense of pragmatism and gives in to Diomedes’ advances. Troilus, not being extraordinarily perceptive, can only see a whore (where before he had only seen the saint erected in his mind), which drives Cressida further away, further confirming her self-opinion. Wrinkles Apollo’s, and makes stale the morning. And turn’d crown’d kings to merchants. That we have stol’n what we do fear to keep! To close the day up, Hector’s life is done. HECTOR: I am unarm’d; forego this vantage, Greek. A: Strike, fellows, strike; this is the man I seek. So, Ilion, fall thou next! Now, Troy, sink down! Here lies they heart, thy sinews, and thy bone. I have ignored in these ramblings, Pandarus, Ulysses and the acerbic Thersites, all of whom play important roles in the unfolding of events but I can hope that this brief review will inspire you to take a look (or another one) at the play. There’s more to it than apparent at first glance. You can see where Shakespeare begins to wrestle with the great, humanistic themes of plays to come like Othello, King Lear and The Tempest, and where he continues to struggle with issues raised in past works like Romeo & Juliet and Hamlet.